Disney has long been a force to be reckoned with – a studio with a laudable history that invented the idea of a full length animated film. I am a fan. A career resurgence began in 1989 with the release of The Little Mermaid and continued on through the ensuing decade. Since 2000, the Mouse House has released respectable work of various highs (Big Hero 6) and crushing lows (Chicken Little) but nothing that has really pushed the medium to the next level. As great as beloved titles like Tangled and Frozen were, they were still a reworking of traditional princess fairy tales. Since 1995, Pixar has taken on the mantle of raising the bar. Now with Disney’s 55th animated feature film, they have done something innovative. They’ve brilliantly captured the political zeitgeist and manipulated it into an entertaining adventure involving the police, race relations, and diversity. A lot of people contributed to Zootopia. Jared Bush and Phil Johnston wrote the screenplay but a jaw dropping group of eight writers receive story credit. That’s usually cause for alarm, but their vision remains surprisingly focused. That the achievement feels effortless and light is an amazing balancing act that deserves kudos. “Don’t judge a book by its cover” is one message, but the narrative is rather astonishing in its ability to a tackle a seemingly simple moral with utter depth. It’s the tale of an anthropomorphized animal kingdom starring one “dumb bunny” Judy Hopps (Ginnifer Goodwin) and one “sly fox” Nick Wilde (Jason Bateman). But those nicknames aren’t who they really are. This concerns how each must transcend the stereotypes that they are beset with. Predator vs. prey is the line that divides them, but this is a new age. In Zootopia, predator and prey exist side by side. They have learned to set aside their differences and co-exist in peace. The smartly crafted story has a distinct moral. This thriving metropolis separated into distinct communities. 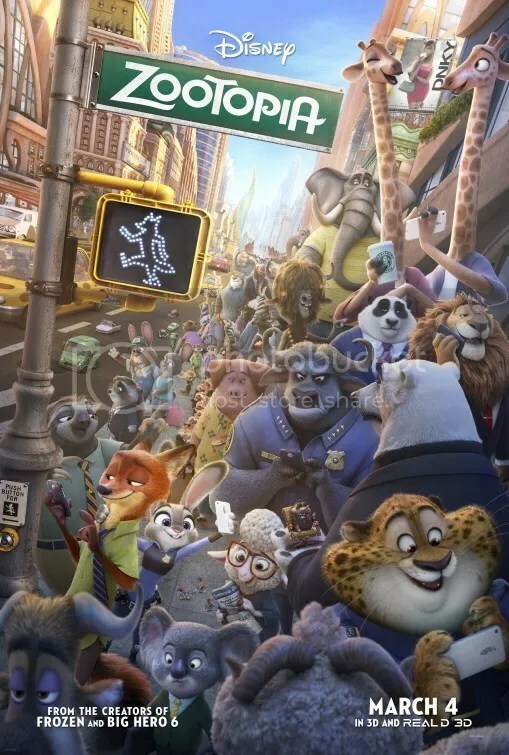 Like New York City, Zootopia is a dazzling municipality divided into boroughs. The filmmakers have fun with these settings. The fantastic world designed is a character in and of itself. The breathtaking depth to which they have created a fully realized world is impressive. The districts feel like living breathing environments. Each habitat sustains the climate required by the animals that live within. There’s Little Rodentia, a neighborhood that caters to mostly tiny rodents. Polar bears live in freezing Tundratown. Desert mammals like camels exist in hot Sahara Square. Jaguars, otters and sloths live in Rain Forest District and then there’s Savanna Central which is the downtown central hub where everyone converges. According to Mayor Lionheart (J.K. Simmons), “In Zootopia, anyone can be anything.” The cast is a splendid collection of characters each imbued with a captivating personality that uniquely enhance their visual design. Particularly memorable are Chief Bogo (Idris Elba) as the blustery head of the Zootopia Police Department (ZPD) and Assistant Mayor Bellwether (Jenny Slate) a sweet sheep, sympathetic to Judy Hopps plight. Judy wants to be a cop but no rabbit has ever done that line of work. The ZPD is run by large mammals, such as rhinos, elephants and hippos, and lions. Through sheer determination and an assist by the diversity program Judy achieves her dream. There’s a lot jokes that use scale as a way to highlight how challenging it is for these various animals to co-exist in the same world. When Judy Hopps became the first rabbit on the police force, you truly appreciate why her accomplishment is so commendable. Conversely watching Judy pursue a suspect around Little Rodentia, it gives you an appreciation for how tiny this district really is. She’s initially assigned parking detail but soon circumstances intervene and she’s on a real case to help Mrs. Otterton locate her missing husband. The fun is in the way Disney employs the DNA of pop culture to produce this massive homage. Inside jokes abound that will require multiple viewing to catch them all. Previous Disney films that appropriate animals with human qualities are inspirations. The Jungle Book and Robin Hood are obvious influences. Nick Wilde could be Robin Hood’s fox twin. Like that feature, the animals are completely anthropomorphic. They walk upright, wear clothes, drives cars and converse with one another exactly like people, yet still keeping their bestial behaviors – like a twitching nose – intact. Some individuals recall other cartoons as well. Officer Clawhauser (Nate Torrence), a police dispatcher, is a cheetah that suggests Snagglepuss’ upbeat temperament. I was getting Pete Puma vibes from a laid back yak named Yax (Tommy Cong). His scruffy mane covers his eyes while flies buzz around his head. Far out man. But the pop culture allusions don’t stop with animated titles. Some personalities even cite live action. A diminutive mole Mr. Big is a mob boss straight out of The Godfather. A drug operation is run by two rams named Walter and Jesse. Even some adults will miss that as a Breaking Bad reference. Zootopia manages to address racism, the crack epidemic and how authorities use scapegoating to supplement their power by instilling fear of marginalized groups. Whew! No it’s not subtle, but it isn’t heavy-handed either. What makes the lesson so palatable is in the details. Visually it’s a marvel and if it my review were based solely on spectacle, it would be enough. Zootopia goes deeper by catapulting the ongoing discussion of prejudice to the front and center of a Disney cartoon. There’s so much subversive wit. Calling a bunny “cute” is not acceptable, unless it’s coming from another bunny. Judy finds Nick “articulate” but he finds the remark more condescending than complimentary. A characters can’t refrain from touching the woolly sheep’s hair. The way the observances are manipulated into the animal world is funny and incisive. It’s difficult to be both. For all its ability to undermine established stereotypes, the film isn’t above exploiting them as well. There’s good natured ribbing at the expense of clichés of the zoological kingdom. Faraway rural Bunnyburrow is affected by a wildly expanding population. Wolves can’t resist baying at the moon the second someone howls first. The sloths are slow and work at the DMV (Department of Mammal Vehicles). The “sly”fox is indeed a con man. Oh but he wasn’t always this way. He transcended that stereotype as a child but ultimately succumbed to it thanks to overwhelming societal pressure to be anything more. Disney’s most politically motivated movie ever is a trenchant reflection on diversity. No the predator vs. prey allegory doesn’t stand up under intense scrutiny. What then do the carnivores eat if not other animals? That is never addressed. It’s easy to get bogged down in how the symbolism to our world doesn’t hold up. The fable is better appreciated as a morality tale that addresses topics very much in the zeitgeist. Living in harmony is possible. Our strengths and weaknesses can complement each other. The takeaway is – respect your fellow man. This entry was posted on March 6, 2016 at 5:05 am and is filed under Action, Adventure, Animation, Comedy, Family, Uncategorized. You can follow any responses to this entry through the RSS 2.0 feed. You can leave a response, or trackback from your own site. I enjoyed your review and I’ll comment soon. We liked a lot of the same things. The difference in size between Judy Hopps and the other mammals on the police force for example. That was so amusing. This exceeded my expectations in a way that no Disney cartoon has since the 90s. I think most Disney animated feature films are worth seeing, but this is something special. The crack epidemic too? I knew this was a surprisingly layered animated film, but wow, color me impressed. I’m definitely watching this, just waiting for the families to stop coming in droves 🙂 Pretty sure this will be up in the top 5 for a while though, so my chances of catching this during a slow time that isn’t work time is slim! Yup the crack epidemic. It’s referenced in Night Howlers – a type of flower used to synthesize a drug. Still doing incredible business. #1 movie for a 2nd week in a row. Great review. I watched some clips from this film and they are absolutely hilarious, especially the one featuring a sloth running a number plate. Seems like it’s another entertaining animation from Disney with an important message. That sloth trailer was brilliant. Imagine not giving away the whole plot?! Just show one funny scene. great insight into the movie Mark.i just watched this today and share about the same star rating as yours. this isn’t exactly a typical Disney movie. But it is almost a classic right? I think so. It will need a few years to sit in the public consciousness, but “classic” status seems like only a matter of time. Heard many positive things about this, should be a blast. Like Inside Out, it’s great to see another animated film hold the torch aloft with such apparent resonance. Excellent work Mark! Inside Out is effortless. This is a bit more, shall we say, studied. Zootopia is still a winner. Bummed that I missed Zootopia in theaters given your praise that it brilliantly captures the political zeitgeist and manipulates it into an entertaining adventure about police, race, relations and diversity. All of these topics sound too heavy for most animated films to tackle, which is why I’m impressed to hear that its achievement feels effortless and light. It seems like the filmmakers took great care to craft such an in-depth world with complex dynamics between the characters. Sounds like I really need to catch this one. 2016 has been a great year for animated films. So far, 4 (including this one) have made the Top 10 for the year.